Download "If you have any questions and/or you are ready to schedule your interview, please contact me at 410-287-1615 or drive@cecil.edu." 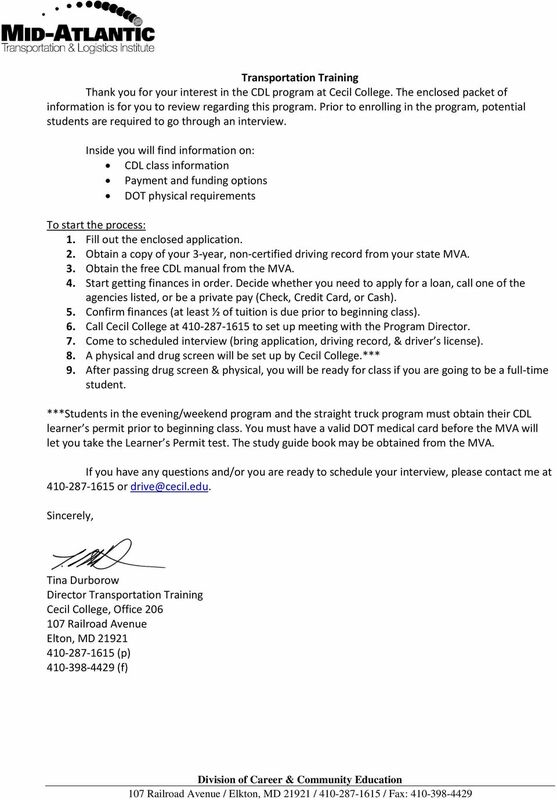 3 FULL TIME TRACTOR TRAILER DRIVER TRAINING CURRICULUM The goal of Tractor Trailer Driver Training at Cecil College is to prepare students for entry level driving positions in the commercial trucking industry. The curriculum is designed for persons who are already licensed as automobile drivers who want to secure their Class A Commercial Driver s License. This content relates to the safe operation of a tractor and a semi-trailer combination. The curriculum is designed for three hundred (300) hours of training in the classroom, on the simulator, on the range, and on the public streets and highways. Evaluations are conducted in all of these areas. Students must have an average of 80% or above in each of the areas of the course, pass the MVA skills test in a maximum of two attempts, and attend a minimum of 80% of the training to complete Tractor Trailer Driver Training successfully and receive a completion certificate. 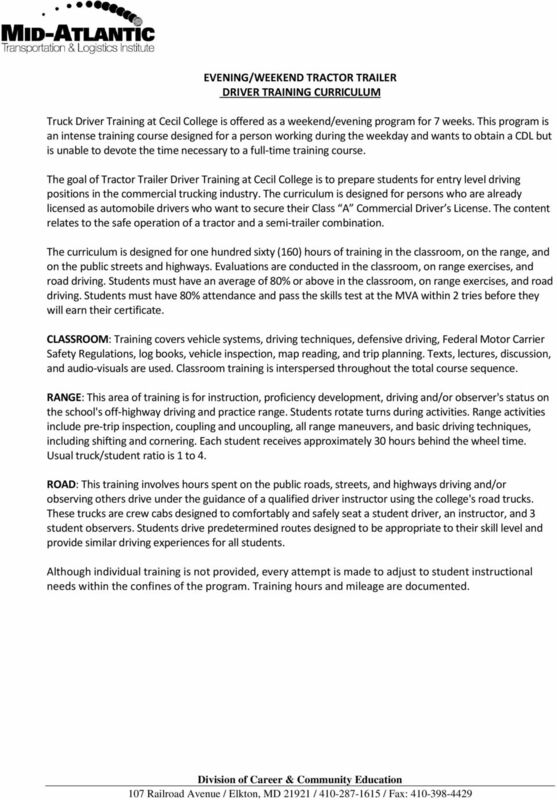 If, by mid-point of the program, a student is unable to operate the vehicle in a manner sufficient to safely begin road training on public streets and highways, the student shall be recommended for termination from Tractor Trailer Driver Training. 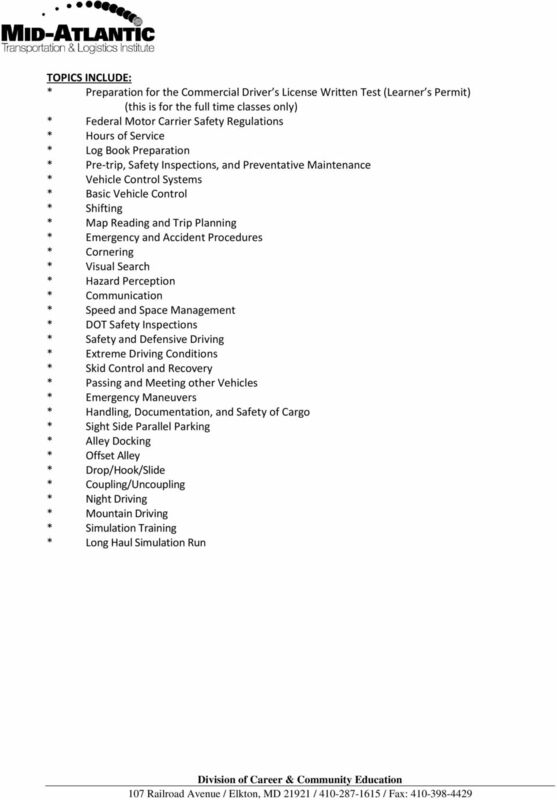 CLASSROOM: Training covers vehicle systems, driving techniques, defensive driving, Federal Motor Carrier Safety Regulations, log books, vehicle inspection, map reading, and trip planning. Texts, lectures, discussion, and audio-visuals are used. Classroom training is interspersed throughout the total course sequence. SIMULATOR: Training on a state-of-the-art simulator is incorporated into the program curriculum to provide skill training without exposing students to actual life-threatening situations. This protects the safety of the student, the equipment, and the general public. RANGE: This area of training is for instruction, proficiency development, driving, and/or observing status on the school's off-highway driving and practice range. Students rotate turns during activities. Range activities include pre-trip inspection, coupling and uncoupling, all range maneuvers, and basic driving techniques including shifting and cornering. Usual truck/student ratio is 1 to 4. ROAD: Training hours in this area are spent on the public roads, streets, and highways driving and/or observing others drive under the guidance of a qualified driver instructor using the college's road trucks. These trucks are crew cabs designed to comfortably and safely seat a student driver, an instructor, and 3 student observers. Students drive predetermined routes designed to be appropriate to their skill level and provide similar driving experiences for all students. Instructor/student ratio is 1 to 4. Each student typically receives a minimum of 200 miles Behind the Wheel, which is approximately hours. * *Although individual training is not provided, every attempt is made to adjust to student instructional needs within the confines of the program. Training hours and mileage are documented. The curriculum is composed of four sections. Subjects in each section are not necessarily listed in order of coverage. Times allowed for each subject area may vary depending on the students' progress. 5 EVENING/WEEKEND TRACTOR TRAILER DRIVER TRAINING CURRICULUM Truck Driver Training at Cecil College is offered as a weekend/evening program for 7 weeks. 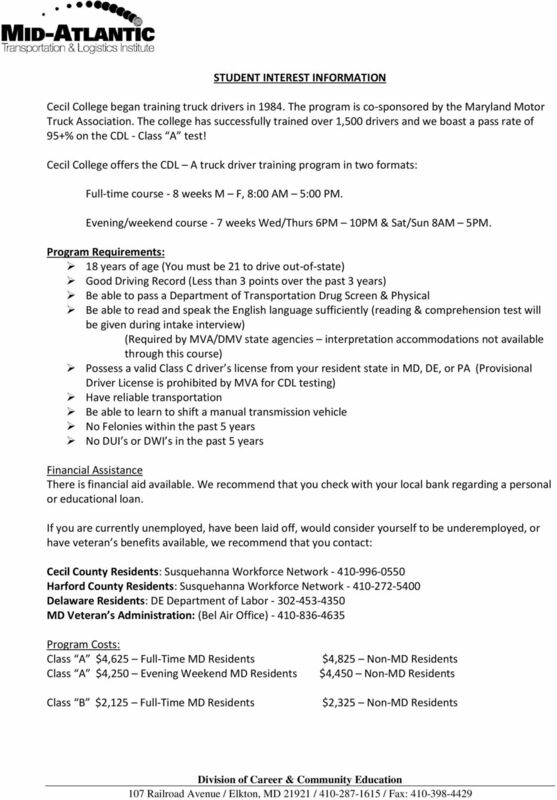 This program is an intense training course designed for a person working during the weekday and wants to obtain a CDL but is unable to devote the time necessary to a full-time training course. The goal of Tractor Trailer Driver Training at Cecil College is to prepare students for entry level driving positions in the commercial trucking industry. The curriculum is designed for persons who are already licensed as automobile drivers who want to secure their Class A Commercial Driver s License. The content relates to the safe operation of a tractor and a semi-trailer combination. The curriculum is designed for one hundred sixty (160) hours of training in the classroom, on the range, and on the public streets and highways. Evaluations are conducted in the classroom, on range exercises, and road driving. Students must have an average of 80% or above in the classroom, on range exercises, and road driving. Students must have 80% attendance and pass the skills test at the MVA within 2 tries before they will earn their certificate. 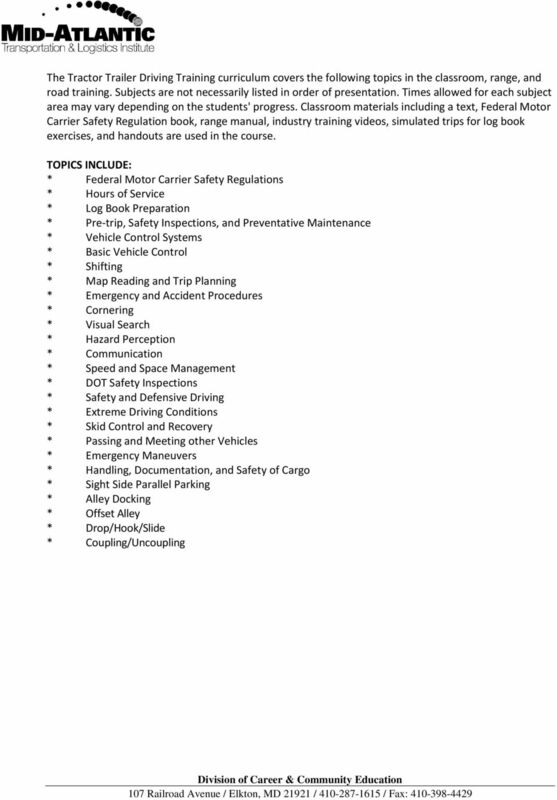 CLASSROOM: Training covers vehicle systems, driving techniques, defensive driving, Federal Motor Carrier Safety Regulations, log books, vehicle inspection, map reading, and trip planning. Texts, lectures, discussion, and audio-visuals are used. Classroom training is interspersed throughout the total course sequence. RANGE: This area of training is for instruction, proficiency development, driving and/or observer's status on the school's off-highway driving and practice range. Students rotate turns during activities. Range activities include pre-trip inspection, coupling and uncoupling, all range maneuvers, and basic driving techniques, including shifting and cornering. Each student receives approximately 30 hours behind the wheel time. Usual truck/student ratio is 1 to 4. ROAD: This training involves hours spent on the public roads, streets, and highways driving and/or observing others drive under the guidance of a qualified driver instructor using the college's road trucks. These trucks are crew cabs designed to comfortably and safely seat a student driver, an instructor, and 3 student observers. Students drive predetermined routes designed to be appropriate to their skill level and provide similar driving experiences for all students. Although individual training is not provided, every attempt is made to adjust to student instructional needs within the confines of the program. Training hours and mileage are documented. 7 FULL TIME STRAIGHT TRUCK OVERVIEW The goal of Truck Driver Training at Cecil College is to prepare students for entry level driving positions in the commercial trucking industry. The curriculum is designed for persons who are already licensed as automobile drivers who want to secure their Class B Commercial Driver s License. 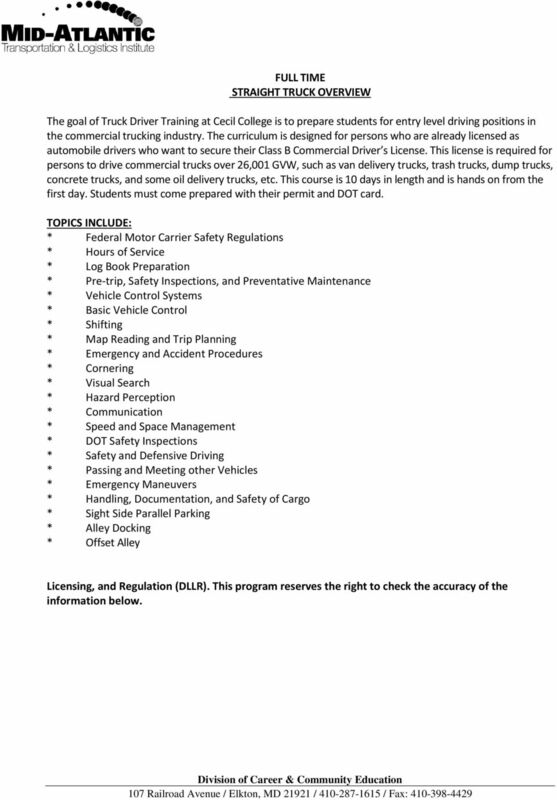 This license is required for persons to drive commercial trucks over 26,001 GVW, such as van delivery trucks, trash trucks, dump trucks, concrete trucks, and some oil delivery trucks, etc. This course is 10 days in length and is hands on from the first day. Students must come prepared with their permit and DOT card. TOPICS INCLUDE: * Federal Motor Carrier Safety Regulations * Hours of Service * Log Book Preparation * Pre-trip, Safety Inspections, and Preventative Maintenance * Vehicle Control Systems * Basic Vehicle Control * Shifting * Map Reading and Trip Planning * Emergency and Accident Procedures * Cornering * Visual Search * Hazard Perception * Communication * Speed and Space Management * DOT Safety Inspections * Safety and Defensive Driving * Passing and Meeting other Vehicles * Emergency Maneuvers * Handling, Documentation, and Safety of Cargo * Sight Side Parallel Parking * Alley Docking * Offset Alley Licensing, and Regulation (DLLR). This program reserves the right to check the accuracy of the information below. The Truck Driver Training program instructors will continue to use the action plan. BASIC INFORMATION. Yes No in the last five years? Is applicant a Limited (incorporated) company? Yes No. Current Insurer: Policy No. 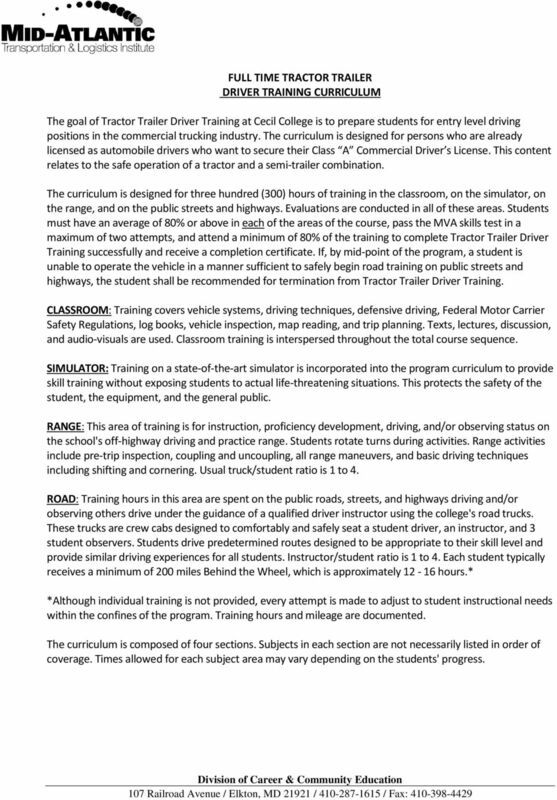 UMTRI Report 213-34 Evaluation of the Michigan Center for Truck Safety: Effectiveness of Training Programs Lidia P. Kostyniuk, Daniel F. Blower, David W. Eby, Lisa J. Molnar, Nicole Zanier, Renée M. St.
WHITE LINE CDL TRAINING 3907 SW Burlingame Road - Topeka, KS 66609 785-266-3230-785-554-3889 whitelinecdl.com - whitelinecdl@att. 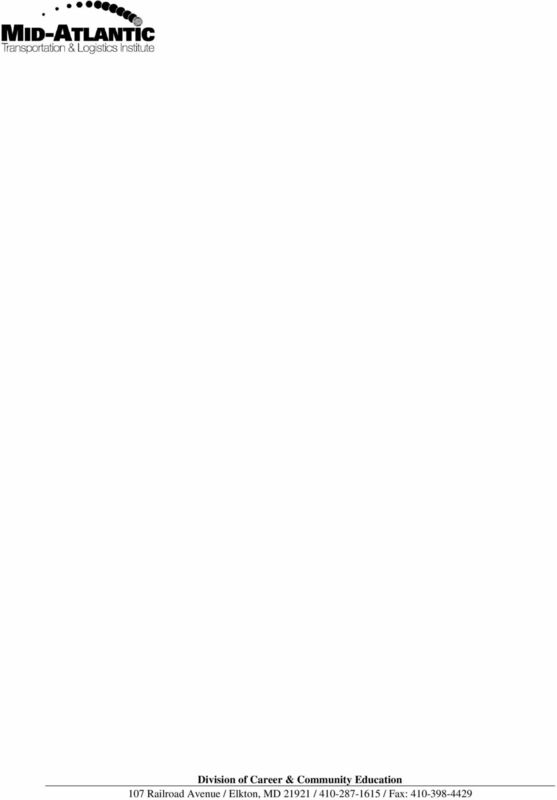 P 371-GC (Rev. 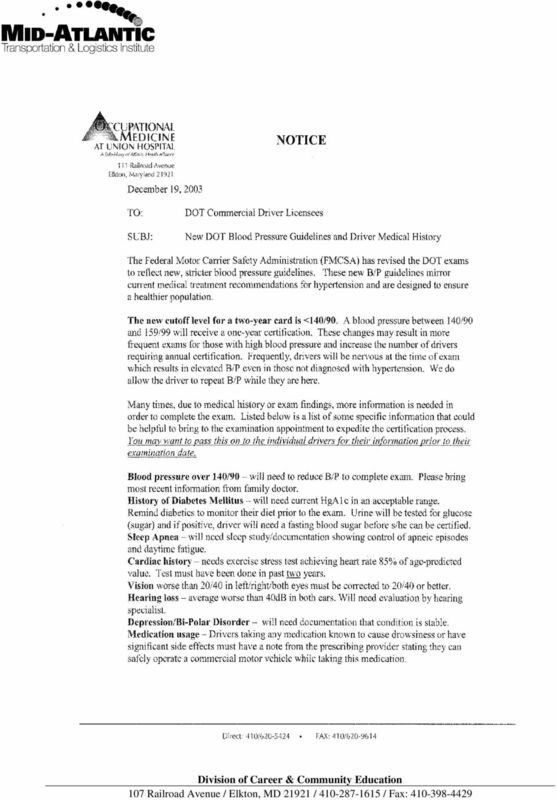 11/14) Authorized by the Motor Carrier Act, Act 254 P.A. 1933, as amended. DEPARTMENT OF LICENSING AND REGULATORY AFFAIRS MICHIGAN PUBLIC SERVICE COMMISSION MOTOR CARRIER DIVISION P. O. Corporate Brochure FALCON MOTOR XPRES S LT D....Solutions to Your Cargo Needs! Truck Application DESCRIPTION OF OPERATIONS. LIABILITY COVERAGE Complete for desired coverages by indicating limits of insurance. DRAFT. Get on the Road to a Great Career. Become a CDL Driver. South Carolina s Trucking Industry is Hiring!